How To Make Organizational Change Stick - esther derby associates, inc.
Too often organizational change is viewed as a matter of designing a new processes, training people in the new processes, and then coaching/rewarding/punishing them to follow the new regimen. Some changes are like that–but most significant changes are not. When is organizational change needed? Say the managers in an organization have decided that they want the productivity and morale benefits of cross-functional teams. So they put together a cross-functional team–a three developers, a UX/UI person, and a couple of testers. When the team comes back, they are enthusiastic. But after a while, the managers notice that the “team” part isn’t working. Their efforts are fragmented, their priorities are in conflict. No one is intentionally hoarding information, but somehow information that everyone on the team needs to know doesn’t spread to all members. It might be something about the individuals. That’s often where the investigation starts (and usually ends). But it might be something about the visible and invisible structures in the organization that are holding the old pattern in place. Let’s take a look at this through another lens. Most managers work hard to hire the people with an appropriate skills for the job, right people. Managers may also provide coaching, feedback, and training to help people hone their skills and develop their capabilities. Behavior is a function of the Person and the Environment. It’s not quite that simple. Stil, I find this notation useful as a reminder that people’s skills and abilities aren’t the only factors that contribute to performance. Focusing on people is important because our work requires intelligent people with a wide range of functional skills, technical and domain knowledge, and appropriate interpersonal skills. Those people need an environment that supports them to do great work. Now, environment is more than the office layout, and entails more than ergonomic furniture, good lighting and a game room. Organizational factors such as corporate culture, incentives and rewards, personnel policies, management style, access to material support (machines, software, other office tools) all influence performance. This makes real organizational change more complicated than telling someone to change their behavior, sending them to training, or firing them and replacing them with someone new. The good news is that you can influence the environment for your group in ways that increase performance. Take for example the problem of people showing up late for meetings, a problem I see in many organizations. Hidden in this common problem is a simple yet classic example of trying to solve a systemic problem on the individual level. Looking at the problem as disconnected individual events limits options for addressing the problem. People try using ground rules to induce people to show up on time. They offer individual feedback, and stern admonishments to respect other people by being prompt. These may work in the short term, but the problem almost always comes back. It is easy to see this as a failure of will and character. 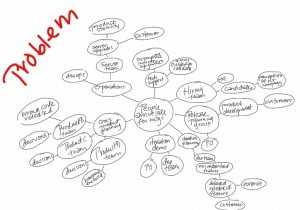 But a problem that reoccurs or shows up in many places in the organization is usually a system or environment problem. 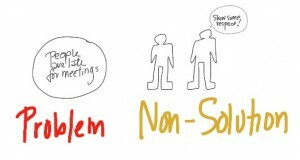 A wider view of the “late to meetings” problem. Taking a wider view shows that “showing up late for meetings” isn’t a trivial matter. For the most part, this behavior has little to do with intentional or unintentional disrespect (an exception described here, thanks to Bob Sutton). It’s a problem that might necessitate a deep solution: organizational change. Where else have you likely seen this problem? Let’s take the example of someone who isn’t “pulling their weight” on the team. Someone deemed to be not doing their job. What’s really going on here? They think they are doing it. That’s a mismatch between expectations or a miscommunication. They don’t know why they should do it. When people don’t see a reason to do something, or the impact of not doing something, it may drop to the bottom of the priority list. They think the what they are supposed to do won’t work, or will make things worse. Let’s face it some of the stuff that comes down from management is a crock. Like when I was told not to give feedback to any of the contractors on a project I was managing. So I’m supposed to let them continue doing something wrong that will jeopardize the project? I think not. They think something else is more important. People do what they think is most important. And when priorities aren’t clear, they do what they find most interesting or enjoyable. There is some negative consequence (maybe not obvious) for doing some aspect of their job. Like following a new standard (like “all errors will be handled without terminating the program”), I’ll have to sift through 1/2M lines of code in a legacy system, find all the instances that violate the standard, fix them, and test the fixes. Oh, and not miss the deadline on some other project. There are obstacles outside of their control. Dependencies outside the team, lead-times on ordering equipment, facilities rules, policies, procedures…. Problems off the job. I worked with a guy who was dropping the ball with some parts of his job. When I talked to him, I found out that he was going through a messy divorce, and was spending a lot of time with lawyers and mediators. I got him hooked up with employee assistance for support and arranged time off for appointments. And that was enough to solve the work problem. No one could do the job. Like trying to fit 10 pounds of rocks in a 5 pound bucket. Or completing a project or task in a time period that no one could. As you can see, there’s a lot more going on here than just a “simple” case of someone not performing. Root problems can lie much deeper than the individual: in the system. System problems are management problems, not individual problems. Incomplete communication about a task or job is a management problem. Not setting context is a management problem. Unrealistic expectations are a management problem. And they require organizational change. What’s a Change Agent to do? One of the biggest mistakes people make is attributing system problems to individuals (and individual problems to the system). We’re quick to pin the blame on individuals, when it may be a system problem or a management problem. If you try to solve the problem on the wrong level but what’s needed is organizational change, you are doomed to fail. Systems thinking isn’t new. Jerry Weinberg’s An Introduction to General Systems Thinking was first published in 1975. Senge’s Fifth Discipline came out in the 90s. Still, we haven’t turned the corner on this thinking revolution. That may be because the pragmatic benefits of the systems thinking approach aren’t always clear, and some people find system diagrams inaccessible. Further, it’s not always easy to see what’s a system problem and what’s not. Even if they can, people may just feel overwhelmed by the thought of all that’s needed to make an organizational change. But that’s no reason to back away from it. Below I’ll give you a simple and straightforward method for making system changes that stick. By now you likely see that, at times, it’s organizational change that’s needed. But how do you know when I have a system problem versus an individual problem? How do you know when it’s organizational change that’s needed? Multiple factors interact to produce the result. When you suspect a system problem, gather data that will help you understand the how the system performs, and how various factors interact. The following steps outline one way to “see” your system. Expand the time horizon. Look back to the point where the problem may have started. If you have historical data, look back at least two years. Notice any events that might have precipitated the problem (but don’t jump to conclusions). Brainstorm factors that might be related to the problem. Choose factors that are potentially measurable. Name those variables using neutral or positive language to avoid confusing double negatives. Sketch a graph of the variables to see how they move in relationship to each other. Notice whether they move in parallel, in opposite directions, or seem unrelated. Formulate a hypothesis based on the graph. See if you can test it in a small way. Look at how the system may be contributing to the problem. And look at how you as a manager, or the managers in your organization, might be contributing to the problem. Then fix the problem rather than affixing blame, and do it quickly. So you’ve stumbled upon a system problem. What next? You’re probably already well aware that change isn’t perceived the same by all. And even if it’s the right direction, it can take some time for people to get used to organizational change. People have to recognize the situation. One person at the group told a company that was losing billions, but kept cancelling projects that produced revenue, and funded projects that failed. The problem was obvious to anyone who *could* see. But the senior managers had a mental model of operating as a monopoly, and updated neither their mental models nor their corporate accounting systems. So they didn’t see it. People have to believe it is possible to change the situation in some way. If people don’t believe it’s possible to change, they are paralyzed. There are some things can’t be changed, that are out of the sphere of influence or control. People often forget that even when they can’t change external circumstances, they can change their response. People need to have some idea of how to shift the situation. When people have no earthly idea how to shift the situation, they become paralyzed. So paralyzed that they don’t seek help in the form of new ideas or expertise. Or they grasp at the first silver bullet that’s offered (which often makes the situation worse). Or they do nothing. So how do you create the conditions for change in your organization? It’s not just a matter of telling them it’s good or showing them. They have to believe. And that isn’t something that happens immediately or even overnight. It takes time, and it takes shared information. When people lack information, they fill in the blanks–sometimes with something titillating, and sometimes with what they wish were true. In situations of stress or change, though, they tend to fill in the blanks with their worst fears. That’s one of the reasons it’s so important to communicate during periods of organizational change. tell them that, in some cases, you don’t know the answers. Talk to people more than you think you “should” have to. Then listen (and listen and listen). And empathize, because change isn’t about logic, it’s about emotion. If only it were that simple. What do you do about people who disagree with you? Why don’t they get it already? Let’s explore that thought. A while back, I sat in on a birds-of-a-feather session on organizational change. The main theme was bemoaning the difficulty changing even mid-sized organizations. When people talk about how hard it is to bring change there’s a tendency to blame: people who don’t turn on a dime are labeled resisters, NoNos, dinosaurs, laggards. There certainly are people who don’t change as quickly and with as much enthusiasm as the people behind the change would like. When there’s been a failed change or a change that went badly, people may figure that they can simply wait out the change. I’ve certainly seen re-orgs done and undone within a year. And not matter how good a change looks, it’s bad for someone, somewhere in the organization. People have a valid reason not to change–from their own point of view. Labeling them will not help. Most change efforts take a deterministic approach to change. Set the vision, establish a sense of urgency (usually through pep talks) and then pull and push people towards the desired state. That may work with a simple change. But most change isn’t simple. Entirely apart from the (normal) human responses to change, there are structural and systemic factors that make change difficult in organizations of any size. Why does organizational change fail? Sitting there in the BOF, I thought about the times that I’ve seen top down and bottom up changes grind to a halt. Hierarchy acts as a filter. 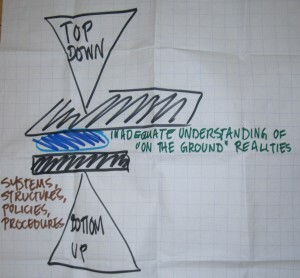 Change from the top can stumble when the desired change doesn’t mesh with realities on the ground. Other top-down attempts at organizational change falter when there isn’t sufficient understanding of the gravity of the need for change–what’s self-evident at the top isn’t communicated to the people being asked to change. Some popular writers on change talk about creating a sense of urgency. One SVP attempted to generate some urgency by declaring he wanted seven scrum team up and running by a certain date because it was his birthday–which generated cynicism. Urgency doesn’t come from a “vision” or from pep talks. It comes from a clear understanding of the current reality and its implications for the organization (and the people in the organization). Bottom-up changes peter out when they run into systems, structures, policies, and procedures that hold the current pattern firmly in place. For example, grassroots efforts to form teams can fail when HR mandates forced ranking. From both directions, it’s critical to understand the visible and invisible structures and how they hold current patterns in place. If you want to change patterns of behavior, you need to know something about the pattern you want to create. You have to understand how the work works, see the system and change the system. Pulling and pushing people won’t change the pattern (but it will result in the predictable responses that people have when they feel they are being pulled or pushed). So what are the components of a organizational change that sticks? Are you creating an environment for success? People need to know what the priorities are. Managers don’t (and can’t) make all the decisions about how work is done. Managers need to establish clear priorities so that the people closest to the work can make good decisions. Communicate a clear mission and ensure that each person understands his top three priorities. People perform better when they understand the mission of the group and what’s most important. People can’t do their best without the right tools for the job. But hardware and tools, of course, aren’t the only resources people need. They need time, access to expertise, and training. No one I know can manufacture time, but setting clear priorities and keeping the workload reasonable reduce the sense of overwhelming demands. When budgets are tight, find inexpensive ways to feed the need for training and expertise. Offer to buy books for a lunchtime study group and support access to content websites and other free sources of information. People desire respect. Every once in a while I hear a manager assert that people work best when they’re a little afraid. I don’t buy that. Show respect by keeping promises, communicating openly, and listening to other people’s ideas. Don’t take phone calls and pages or check email during meetings, especially one-on-one meetings. People want challenging work. Make work assignments based on interests, or better yet, work with your team to have them self-organize. That way, people will have a chance to choose work that appeals to them. Now, every group has some scut work. Rather than assign that to one unfortunate person, rotate responsibility for the work no one really enjoys, but everyone recognizes is necessary. Are there environmental roadblocks stifling performance? Suppose you’ve done all of these things (and more) to establish an environment for success and implement an organizational change. Your work is not done. Corporate culture and norms are part of the environment and so are policies, procedures, measures, and reward systems. Examine the organizational environment to see if there are other obstacles that keep people from doing their best. Are there factors that actually punish people for doing a good job? I once worked with a support group that was having a crisis in customer satisfaction. Support agents were expected to meet certain targets for the length of calls.That worked fine with simple problems, but when a tough problem that took more than a minute or two to fix came along, it was a problem. The measure actually punished people who went the extra mile for the customer and stayed on the phone long past the allotted time. These folks had the knowledge and skills to perform, but an environmental factor (a poorly designed measure) was in the way. Sometimes policies and procedures are the culprit in stifling performance. One organization I know of requires bi-weekly budget reporting and forecasting. It can take up to seven working days to assemble all the bits of information needed to create a report. The procedure is difficult and frustrating, and the time people spend every month on budgets means they aren’t doing other valuable work. In another group, each team member is required to provide written feedback to every other team member every quarter. It wasn’t so bad when there were five team members, but now that there are twenty people in the group… well, you can do the math. Pile on enough environmental roadblocks and people become frustrated and cynical. And frustrated, cynical people are less likely to do a good job. Individual managers can’t always change measurement systems, policies, and procedures. Insulate your group where you can and put the rest in context. Organizational change takes work. But it can be done. Remember that an individual’s skills and abilities aren’t the only factors in performance. Managers need to attend to both the person and the environment when assessing performance. Don’t wait until the next performance evaluation season rolls around. Evaluate the work environment now and make the organizational change that’s needed. Does the management infrastructure enable high performance? Are you working to remove or reduce the obstacles that are hampering performance? What else can you do to create an environment for success?